JD Disalvatore, an American LGBT award winning film and television producer/director and gay rights activist, was diagnosed with Stage IV Breast Cancer. 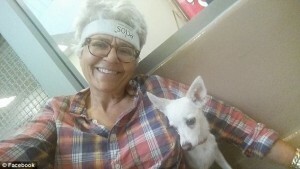 As anyone knows who has been touched by cancer, it can be overwhelming, but during this difficult time (and only thinking of herself) she has made it her mission to save the dogs of Los Angeles and turn it into a “no kill” city. Her passionate journey began when she began volunteering for the East Valley Animal Shelter and saw firsthand the reality of dogs and cats being euthanized. However, the experience also introduced her to the passionate people, rescues, and organizations that are fighting to save these precious beings from euthanasia. Those experiences led her to make the documentary called “How to Save a Dog”, and it will showcase the incredible effort it takes to rescue a dog. She will also include a series of 20 to 30 educational videos for social media to help educate the general public and different subjects (i.e. How to Foster a Pet, etc). For more information on her project visit the official website here. Ms. Disalvatore is an inspiration to us all!